I had asked my friend if he had any stories or tales from his childhood that his family would tell. He comes from an area of Kansas City, Missouri that is traditionally an African-American community, and he told me a tale, a fable, that his mother used to tell him when he was growing up. The snake slithers off, takes a moment to pause as he decides to answer. And he looks back at the man taking his last breaths, and he says, “You knew what I was when you picked me up.” And he slithers off. This tale is a fable that has a clear moral, like most fables, which is that you should not offer your help, your aid, to someone or something that you know to be dangerous. This tale is also serving as a warning to not trust the promises of a desperate man, and to be wary of those who might stab you in the back. This is the kind of tale that would be told, and is told, to children. After all, the informant’s mother would often tell this story to him when he was growing up. The fact that the informant grew up in a traditionally African-American part of the city he lived in, would suggest that this tale is African in origin. I was wandering down the main street of Lahaina, HI, when I saw two people weaving coconut palm fronds into fish, roses, and a couple of other designs. I stopped and asked the young woman about palm frond weaving. Me: These are really neat. Where did you learn how to weave palm fronds? Me: Where did your friend learn, and why do you do it? Informant: He learned in the Caribbean. Apparently it was a common art form there. Here, we do it for fun, mainly. And for the tourists. Me: Do you know how palm frond weaving originally began? And why the fish, the roses, and the crosses? Informant: I don’t know exactly, but apparently weaving palm fronds has roots in Christianity. You know, Palm Sunday? Me: Oh? That would make some sense, I suppose. Given how palm fronds are associated with Palm Sunday, I can see how weaving palms became a tradition. Informant: Yeah. Though it is not solely a Christian tradition. It is simply associated with Easter and Palm Sunday the most, which is why most of the designs that are woven are crosses – the most recognizable symbol of Christianity, especially during Easter, doves – a symbol for peace, hope, and the Holy Spirit, and the fish – which became a symbol of Christianity during the days that Christians were persecuted by the Roman Empire. Me: Ah. Interesting. And the roses? Informant: That is not so much religious roots as it is more to express gratitude, or to be given to someone who has lost a loved one. You know, like how you would give flowers to someone as a gift? Palm frond roses are essentially the same. Me: Okay. Makes sense, as roses do not have as much of a symbolism in Christianity, especially around Palm Sunday, as some of the other designs do. So how widespread is palm frond weaving? Informant: People all over the world do it, as it has become a Christian tradition, as due to the European explorers and colonization, Christianity has been spread worldwide. Though my friend and I don’t do it so much for the religious aspects. Me: Interesting. Well, thank you for talking with me. Informant: You’re welcome, and I hope you do well. I find it to be incredibly interesting that palm frond weaving has become a Christian tradition. Until this interview, I had never known of this Easter and Palm Sunday tradition. Palm Sunday celebrates the day that Jesus entered Jerusalem. As he was entering the city, the people laid palm fronds down in front of him. 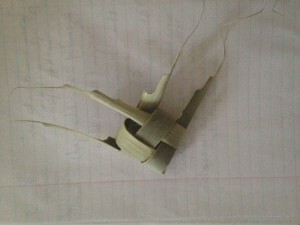 To me, this practice of weaving palm fronds on Palm Sunday is rather like a kind of magic – using the palm fronds at that time and weaving them into such shapes is a kind of ritual that helps to connect the practitioner with his/her faith, as Easter is the most important holiday for Christians no matter their denomination. The cross is almost like a talisman, a reminder of how Jesus was welcomed into the city and how he was betrayed and killed not a week later. The dove is often a symbol of hope and peace, such as what Christ’s resurrection offers to Christians. The fish is a reminder of the persecution that the early Christians suffered as their Messiah suffered under the Roman Empire. When fully cooked, cool completely. Mix the barley with 1 pound raw ground beef and 2 pounds raw ground pork. Hang at room temperature for 3 to 5 days. I was discussing with my mother via skype about home remedies that she knew of, or that her mother used to do for her and her siblings when they were sick. Me: I remember you once saying that your mother had a couple of home remedies that she would use with you when you would get sick, yeah? Informant: M’kay. There were certain things that mom did when we were sick, especially when we were sick to our stomach. First of all, she would give us 7-Up. Informant: Cause 7-Up she believed would settle our stomachs. To this day I despise 7-Up. Informant: And another thing she did, was to put us to bed with a bath towel. Informant: And the whole idea of that, well the idea behind that was actually quite practical because my bedroom was pretty far from the bathroom, and if I had to throw up and I couldn’t make it to the bathroom, mom wanted my to be throwing up into the towel. But, for me, that towel ended up being very very comforting; and I used to kind of snuggle that at night when I wasn’t feeling good and it made me feel better just having it. Me: Is that where I got Magic Towel from? Informant: That’s why you got Magic Towel. Informant: Because when you were little, you had an upset stomach one night and I didn’t have any medicine that either you would take or I could give to you. And so I gave you that towel and I told you that it was a magic towel and that if you hugged it real, real tight all night then you would feel better in the morning. Informant: And the next morning, you felt better and you looked at me and said, “I have a new B.” ‘Cause that’s what you used to call all your blankets. And you put it at the bottom of your bed and Magic Towel stayed with you longer than any other B. Me: Despite having lost it multiple times and having to replace it. Me: No, it was more than that. I think it was at least twice. Informant: Could be. I remember that it got left in the Dallas airport once. Me: Yeah, I remember that one. Informant: Not on my watch. Informant: It was daddy. Daddy help – let you forget it. So does this help? When hearing this story, and especially about the taking the bath towel to bed, I realized that there is a reason why these folk remedies are passed down. It is because they work. Whether they are born from practicality or herbal medicine, if they work, then they are remembered and passed down to the next generation. Now, 7-Up, like many other sodas (including Coca-Cola), was originally created as a medicine, and it is highly likely that my grandparent’s generation believed such sodas to actually do what they were advertised to do. With the bath towel, though born of practicality, it was the belief that my mother had that it would work to cure an upset stomach that made it work. It is an example of the placebo effect. Also, the fact that my mother used this remedy for me, and that it worked, shows that such remedies, over time, can become family traditions, or traditional remedies within a family. I still sleep with magic towel, and I have never gotten sick in bed since my mother first handed me a towel. We may have had to replace the actual towel a couple of times, but it wasn’t the towel that was important, it was the concept of the magic towel and the belief that it worked that mattered. My parents and I were lounging around in our rental house over Spring Break, and we got to talking about family. My father is from somewhat rural Kentucky, and has told a few stories about his family to me before. So I asked my father if he knew of any family legends, and my mother, overhearing the question, suggested to my father, who was trying and failing to come up with something, to talk about the family silver. Me: Do you know of any family legends or anything like that? Mother [in background to informant]: The silver. Your silver. Informant: Ah. I’ve got a family legend for you. Yes. You know the silver we have at home? For when we have company? Informant: Okay. You know that the initial that is on it is an H, not an A? Me: Okay…To be honest, I’ve never noticed an initial on it before. Informant: Well there is an initial on it, because part of the custom for having stuff like this is to have a family crest or family initial on it. And the initial on this one is H, because this came from my Uncle Charlie. Charlie Hatfield. Me: Okay. As in Hatfield and McCoy? Me: And how do you spell that? Informant: N-E-L-I-A. Probably from Cornelia. Her name was probably Cornelia. Acquired this silver that is inscribed with an H, as in Hatfield. And part of the story is that in Kentucky, everybody is related to either the Hatfields or the McCoys in some way. So we are apparently related to the Hatfields in some way. How I don’t know. Kay? And it may be no more than just the coincidence of the name. But in Kentucky, this would be the story of how we’re related to the Hatfields. So cousin Charlie, which is what my grandmother called him, because he was the cousin by marriage of my grandfather. Write this down. Informant: Cousin by marriage of my grandfather may have been related to the Hatfields. And that’s the story of the family silver. Me: And what is the story of the Hatfields and the McCoys? Informant: It’s a kind of Romeo and Juliet story. The Hatfields and the McCoys were two families from Eastern Kentucky in the mountains where people are very family proud and they had some kind of enmity between them. But a boy from one family and a girl from the other family either ran off or got it together in some way. Or he may have abducted her, I don’t know. But this started a feud, a shooting feud. Informant: Kay? And so lots of people got killed in the conflict between the Hatfields and the McCoys. But Kenucky is not a very big state, so it is possible that Uncle Charlie was somehow related to the Hatfields of Eastern Kentucky although Uncle Charlie was in Western Kentucky. But most of the people in Western Kentucky came from one of two places. One is people with English names like mine came from Virginia. They came from across the mountains mostly after the Revolutionary War to steal land from the Indians, because part of what the Revolutionary War was about was opening up the West, as the British prevented the colonies from expanding Westward. So the Andersons came that way. Basically through West Virginia, the Cumberland Gap, through Tennessee . Kay? And into Western Kentucky. So it is entirely possible that someone named Hatfield from Western Kentucky could be related to someone named Hatfield in Eastern Kentucky because these are English names. How’s that for a family legend? Me: That’s good. Thanks, Dad. This family legend is, like all family legends, about both people and stuff. The people are Charlie Hatfield and Nelia. The stuff is the family silver that my father inherited from his grandparents. The Hatfields and the McCoys are famous names in Kentucky, and everyone in Kentucky is said to be related to either the Hatfields or to the McCoys. Whether Charlie Hatfield was truly related to the Hatfields of Eastern Kentucky or not is unknown, but he shared the name, so it is possible. Thus, this legend may or may not be true, and my father and I will probably never know if “Uncle Charlie” was a relative of the famous Hatfields, but the possibility of this being true is what makes this legend compelling. As it stands, I am set to inherit this silver, and I will certainly want to keep its history alive and tell my kids, when I have them someday, this legend. It is a compelling story, and connects my family to one of the most well-known names in my father’s home state. It was the last full day of my Spring Break vacation in Maui, and my parents and I had signed up for a snorkel/snuba tour out to Molokini Crater and Turtle Beach. The weather was rather poor – a light drizzle – and the water was slightly choppy. I was unable to swim that day, so I stayed on the boat with captain and most of the crew. I got to talking with the captain of the boat, and asked him if he knew of any sailing superstitions, as I knew that there were tons of them. Me: So do you know of any sailing legends or superstitions? Informant: And it is regarding bananas on boats. Informant: Yeah. Have you heard of this before? Me: No, I have not. Informant: Allegedly, it is bad luck to take bananas out on a boat. The reason being, you know, that it will lead to bad weather or mishaps or something like that. And the reason it came to be, from my understanding, and from now, what I understand it is pretty much worldwide. Informant: They, you know, obviously needed food for these long journeys in these outrigger canoes, sailing canoes. And os they would load up green coconuts, green bananas, taros – things like that that would last a while. And they would start their journey. To you know, to Tahiti or Fiji or wherever they’re going. Informant: And they would be fishing the whole time because they needed protein and such and so you would catch fish. And the fishing was not really all that good until the bananas were gone. And so, after the green bananas finally ripened and the everyone ate the bananas, all of a sudden they would start catching fish. Informant: and so they believed that, you know, that once the bananas were gone they would catch fish and good things would happen. They didn’t really put two and two together that once they got a few days out where the fishing was better and they would start catching fish. So that’s where that came from. Me: That is really cool. Informant: Yeah. Here’s one of my more memorable experience concerning this. I remember, before I captained this boat, doing tours out to Molokini and Turtle Beach and other snorkel/snuba spots, I was a fisherman. You know, big game fish – ahi, mahi mahi, the like. Huge fish. Informant: And my first mate was a Hawaiian, and he believed in this superstition wholeheartedly, would refuse to bring a banana on board. So one day, I wanted to prove to him that this superstition was baloney. So I hung a huge, huge bunch of bananas on the boat, and proceeded out to go about my day. Informant: At the end of the day, we brought in about 3200 pounds of fish. Me: Wow, that’s a lot of fish. Informant: Yes, and I told my mate, “See? There’s nothing to this banana superstition.” And he replied to me, “But, if we didn’t have the bananas on board, we would have caught 4000 pounds today, rather than 3200 pounds.” I gave up on trying to convince him that bananas did not bring bad luck when on a boat. Me: Hah. That is awesome. Well, thank you very much for this. It is certainly something that I did not know before. Informant: You are very welcome. I hope this project of yours goes well. This superstition, like many others, deals with the forbidden, or something that is believed to bring bad luck. The explanation that the informant gave for the origins was truly interesting, in that it revealed how a superstition comes into being. The Hawaiians, and the Polynesian peoples in general, taking green fruits, including bananas, onto their outrigger canoes, and supplementing their provisions with fish, would have realized quite quickly that it wasn’t until the bananas were gone that they began catching more and more fish. Thus the belief that bananas on boats were unlucky. A superstition is born when one action is believed to be correlated with another action or state of being. In this example, the first action is bananas on boats, and the second action is no fish getting caught, and the state of being is unlucky. Also, the fact that this belief spread worldwide is interesting. The Polynesians were some of the greatest seafarers of the Pacific, and so they would have passed on the superstition of bananas on boats being unlucky to the peoples that they met on their voyages at sea. Furthermore, they almost certainly would have influenced the American and European sailors who can to Oceania as well. Thus, given that the only method of travel between Oceania, America, Europe, and Asia was by boat, it is not surprising that a, originally Polynesian superstition has now become a belief that sailors worldwide are familiar with, whether they actually believe it or not. Of course, I asked them what the term meant. “Goofy foot” is a blason populaire term used by surfers for left-handed (-footed?) surfers. It is not all that surprising that surfers would have their own term for lefties, since lefties are much less common than right-handed/-footed people. Most of the human population is right-handed/-footed, and in the West at least (Europe, America) left-handedness was considered to be negative, unlucky, incompetent, socially wrong, etc. So, to a population that was 9/10ths right-handed, being among the 1/10th of the population that was left-handed/-footed would look awfully weird, and thus “goofy,” to the “normal,” right-handed/footed people. Furthermore, since handedness in surfing is shown through the stance, the let-handed surfing stance – meaning the feet – would be “goofy footed” to a right-handed surfer. I was once again wandering the streets and perusing the shops on Front St in Lahaina, HI with my mother. I was looking at some fishhooks that were carved from bone when the shopkeeper came to me. We got to talking, and I told her that I had heard of one possible origin to the practice of wearing fishhooks, when she offered up another reason for the practice, and told me the legend, the myth, of how the Hawaiian Islands came to be. Maui, a demigod, was out fishing one day with his brothers. They paddled far beyond their usual fishing grounds. 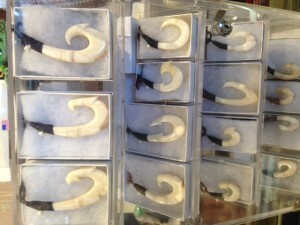 Maui then flung his fishhook, one that was similar to these [see picture above for a decorative example] that he had carved from bone. When he got a bite, he instructed his brothers, who were earthly, to paddle as hard as they could but not to look back behind them. His brothers, who were jealous of Maui’s status as a demigod, turned around and saw that Maui was pulling up, not a fish, but land out of the sea. As soon as they looked, they were amazed, and they stooped paddling. Because they stopped paddling, the land stopped rising out of the sea, so instead of getting a great continent, all Maui got was a small chain of islands in the Pacific. Maui was furious at his brothers, as he wanted a great continent. Thus the Hawaiian Islands came to be. This myth reveals several things about the Hawaiian people. First is that they are a fishing people. They rely on the sea, and thus their fishhooks are incredibly important. Second is the fact that the fishhook is made from bone. Bone, especially whalebone, was considered to be able to become an extremely lucky fishhook. Also, Maui is not just a Hawaiian mythical figure. He features in myths and legends from New Zealand – such as the legend that tells of how New Zealand’s terrain formed; why it is so hilly – and from other areas of Oceania. This can be key in discovering the migration patterns of people into Oceania – how the ancient peoples spread from mainland Asia and Australia into such far-flung and isolated island chains in the middle of a vast body of water. By tracking where similar mythological and legendary figures crop up, such as the demigod Maui, anthropologists and archaeologists can track migration patterns and possible origins for the people of these far-flung and isolated Pacific Ocean Island chains. Furthermore, this myth demonstrates how central to the Hawaiian culture fishhooks are/were. The tourism industry presumably caught wind of this importance and began to make “authentic” Hawaiian fishhooks to be worn as ornamentation and sold as “traditional” Hawaiian jewelry/ornamentation, despite fishhooks never being worn by the Hawaiian people. Nowadays, practically every gift store, souvenir shop in the islands sells fishhooks, and it has become “traditional folk” jewelry. I was wandering through some of the shops in Lahaina, wondering about the abundance of fishhooks that could be worn as necklaces. So I asked one of the shopkeepers about them. Me: So I was curious as to where the practice of wearing fishhooks originated. Do you know? Informant: There are many wild tales as to how the practice started. I had a customer about ten years ago who was very concerned about because of his religious beliefs. He wanted to buy a fishhook but was worried about its pagan connotations. Me: Okay. Makes some sense I suppose. Informant: Yes. So I contacted a friend who lives on another island about this. And his response was that the Hawaiians never wore their fishhooks. Informant: They look like hooks, but they’re not. They are something that was only worn by the royalty, the ali’i, or the representative of a royal. They are called paloas, which roughly translates as “whale’s tooth” or “tongue of the chief,” and they would wear massive ones on dozens of strands of braids. And that was one of the few things that the Hawaiians wore as a culture. This then translated, over time, along with the importance of the fishhook to the Hawaiian peoples, into the practice of wearing fishhooks as ornamentation. Also, these are mostly Maori designs that we have, not Polynesian. So this is one possible origin of the fishhook as ornamentation. I hope that answers you questions. Me: Yes. It does. Thank you very much. To me, it is odd that something that has become such a major part of the consumer culture of Hawaii, something that is often seen as being traditional Hawaiian ornamentation, actually was not used for ornamentation at all. Yes, the fishhook is an incredibly important aspect of the Hawaiian culture, as the Hawaiian’s main source of protein came from the sea. There were no large land animals, no large game birds. Pigs, cattle, cats, dogs, and chickens only came to the Hawaiian Islands when the Europeans brought them. Thus, the fishhook would have been extremely important to the Hawaiians, an idea that was then taken by the tourist industry and turned into a decorative consumer item. I personally even have a fishhook on a length of cord that I got in Hawaii (the Big Island) years ago. Yet, the fishhook as decorative ornamentation has become so ingrained in Hawaiian culture that it might as well have become a folk tradition. It has become part of the traditional Hawaiian culture. I was perusing the shops in downtown Lahaina, HI, when I wandered in to a Scrimshaw shop. Curious, I asked the shopkeeper, who had worked at the shop for more than 20 years, about the art. Me: So what is scrimshaw, and where did it begin? 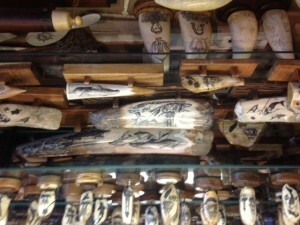 Informant: Scrimshaw is carved and dyed ivory – usually whale teeth and bone. It is New England whalers that scrimshaw is usually attributed to. It is a whaling art that the New England whalers started doing in the late 1700’s early 1800’s when they were out at sea. They were bored, they were uh, they wanted to make gifts for their family members back home, so the teeth and the bone were the leftovers from the whaling industry – the whales were hunted for their fat, their blubber mainly, which was used for, among other things, lamp oil. The bones and the teeth were leftovers, unneeded. And so, the whalers started carving them. The thing about ivories and bone, is that it is one of the oldest mediums that man has worked in general, you know, you get stuff that is carved out of woolly mammoth tusk. Though, so what they specifically attribute to scrimshaw is work such as what is done on sperm whales’ teeth. [See picture for an example of scrimshaw]. And it’s actually an engraving process, where the artwork is hand-engraved into the ivory, which is first polished. Then they take a sharp tool and engrave the design. And then they rub ink into it. Me: Okay. And I noticed that most of the pieces here are nautical themed. Was that the norm for scrimshaw? Informant: Yes. It was more often than not nautical themed, or, when you look at antique pieces it was often of things that reminded the whalers of home. Me: Now, I know that Lahaina was once a whaler’s village, and by the fact that there is a scrimshaw store here, I would assume that when whalers had come here they brought the practice with them? Informant: Yes. How Hawaii comes into play, is that when the whalers started whaling in the Pacific, Lahaina became the whaling capital of the Pacific because we are a natural three-sided port. So they had safe mooring out here by the road stead, the Lahaina road stead. And uh, they didn’t really whale in Hawaii, the whalers just wintered here. Where the actually whaled was around Alaska. Me: Okay. That makes some sense. Follow the migration patterns. Informant: Yes. And because of the ice floes, they would be up around Alaska for much of the year, as all the ships were wooden hulled. So they would sail back down to Lahaina, because back in that era, when they sailed into the Pacific they would have to sail all around the southern end of South America and back up. So it took them months to get into the Pacific and so they didn’t want to try and get back to New England every year. Informant: Yes, thus Lahaina became the home base, if you will, for the Pacific whaling industry. So most of the whaling vessels around Hawaii were at sea for around 2-5 years. Some of them might have been inspired by the tattooing, the Hawaiian/Polynesian tattooing they saw. But, scrimshaw as an art was not inspired by the Polynesians, as they did not work bone and ivory in that way. Me: Awesome. 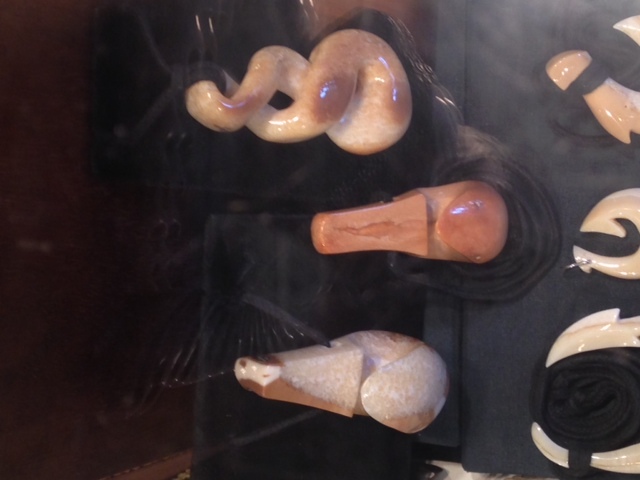 So who would the whalers give these carved and dyed ivory pieces to? And do any of the pieces tell stories or have stories about them? Informant: The whalers would often give these to people back home. Sometimes, when you see the antiques, they will often be documents of the whaling voyage, of things they saw along the way, or sometimes, women were a popular subject matter. Informant: Yes, and so there was a small genre of pornographic scrimshaw, but that was more rare. It was more often with those that they would take pictures from magazines or similar things and essentially copy such pictures onto the teeth/bones. As most, if not all, of them did not have any art training, you know, most of them were illiterate whalers just thinking about their family. So most of the scrimshaw pieces do tell of some kind of event or something similar. So I hope that is what you are looking for. Me: Yeah, this is great. Thanks a lot. Carving ivory, as the informant said, is one of the oldest known practices of mankind. Carved mammoth tusks and bone have been found at prehistoric sites all over Europe. Ivory was most likely used because it is so malleable, and an easy medium to carve or engrave. Scrimshaw, in particular, is probably the best-known example of colonial American folk art. It was created and performed by people who were bored, had no training in art, in engraving or carving or even drawing. Whalers were often illiterate, or at the most slightly educated. They simply put to use the tools and the materials they had on the ship to commemorate a voyage or event on a voyage. Furthermore, with the demise of the whaling industry, the only material now used for making modern scrimshaw is fossilized bone and ivory, which is rather rarer and more expensive to acquire. So, though it began as a true folk art, it is now mostly made by professional artists who can afford the raw materials used as the medium.